A Scripture Lady Event will provide your children’s workers with a great opportunity to learn a LOT of creative ways to share the Bible with their kids. As Christian teachers and parents, we want the best for our children. We desire them to have a fervent and lasting relationship with their Lord and Savior Jesus Christ. We also desire that our children have a hunger and thirst for the amazing life-changing Word of God. The Scripture Lady believes, without question, that the Bible is completely true and without error. It is her desire to come alongside you to help you learn how to effectively teach the Word of God in creative and engaging ways to the children God has placed under your care. This statement has been true for all generations and will be for all generations to come. Teaching the Bible to children must be done effectively. But how do we share the timeless Word of God to a generation of young people who would rather sit in front of their computer all day long? This is a question that should not be ignored, but answered with purpose. Sharing Bible stories and its life-changing message to today’s children does take new techniques. If you think you can simply write a Bible verse on the board and expect to keep the attention of your children while discussing its meaning, you are in for a rude awakening! At no other time in history have children been immersed in so much technology. Therefore, it’s as if our children are wired for greater stimulation to keep their interest. How do you keep their interest? If you don’t know the answer to this question, then let us suggest you need to learn how. It is time to step up to the plate and receive effective Christian teacher training for yourself and those you work with. Please click on the links below to learn more about each set of workshops. Preschool Teacher Training Workshops: Equipping the preschool children’s worker to reach these young hearts with Jesus’ love. Elementary Teacher Training Workshops: Equipping the elementary children’s worker to engage their kids in God’s amazing Word and its truths. Special Needs Ministry Teacher Training Workshops: Equipping special needs ministries to effectively minister God’s grace and love to both children and adults with special needs. 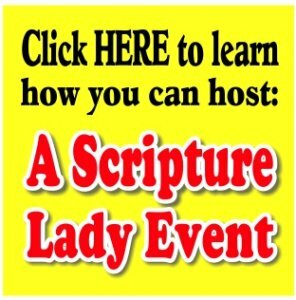 What Does it Take to Book a Scripture Lady Event? 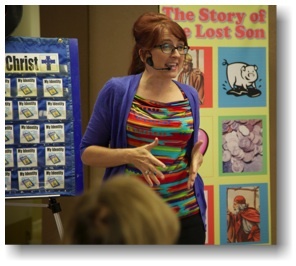 A desire to see your children’s ministry encouraged and edified. A room big enough to accommodate your teachers as well as all of my great props and tools. The supply of four 6′ to 8′ tables for props and products. You also might want to throw in some refreshments to keep your teachers extra happy. The pricing for a Scripture Lady Event will vary greatly depending upon such variables as traveling expenses and hotel accommodations. Please CLICK HERE for a pdf file of a typical pricing breakdown for an event. to book your Scripture Lady Event!